Here in AZ, we don't necessarily long for spring. March is our perfect weather month, our respite before the 100 degree days begin, sometimes in April. Still, there is something about this time of year. Two of my three children were born in the spring, so I definitely feel the "renewal of life" vibe that spring brings. I found a quote I liked (credited as "Proverb"), created it in my Silhouette software, and slapped it on a dollar store plate. 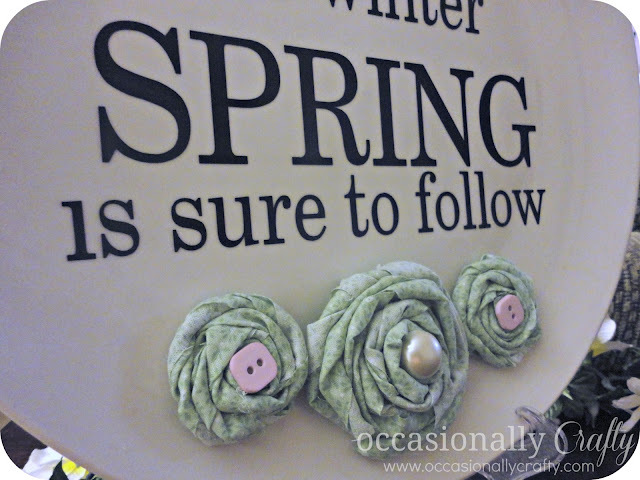 I planned to do some more vinyl shapes at the bottom, but I thought some rolled fabric rosettes would give it that spring feeling too. I had everything on hand, so it was free to me! I hope Spring comes quickly where you live! I'm linking up to some of these fun crafty link-ups: Go check them out! Edited: Thanks for featuring me! That saying is so true!I love that you did this with your Siloutte. And you are right about AZ, March has been perfect so far. Lovely. Wondering what I can do with that quote for my home! Love the cute plate! Thanks for stopping by my blog - I bet these would be great to cover the brace. Just set the beginning chain to the width you need and you'd be set. At 10 rows, it is super simple to crochet. I'm a new follower! Love this saying! My first time to your blog- it's adorable! Super cute, love this idea! Thanks for stopping by my little blog and becoming my newest follower! I'm now following you too! Love all your darling ideas! 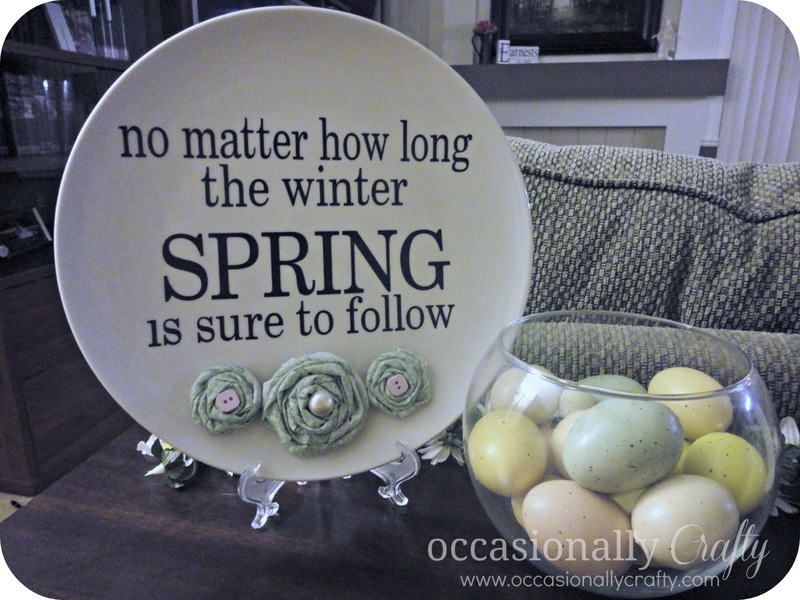 what a cute and thrifty plate...love the idea of using the flowers!!! Hi! Oh I love how you added the rosettes!!! So sweet and I JUST learned how to make them. I see you digi scrapbook. I am having my first giveaway (not many have entered so good chance of winning!) of digital stuff. I'd love it if you entered :-)Thanks again for stopping by my blog! What a sweet sentiment. Lovely work. This caught my eye and I thought I would leave a comment telling you so. ;-) Cute idea! Thanks for sharing. I'm hosting my first Linky party and would love for you to submit to it! What a darling saying. I love the hope it gives me! Great saying, and I love how you decorated the plate. Thank you for sharing! 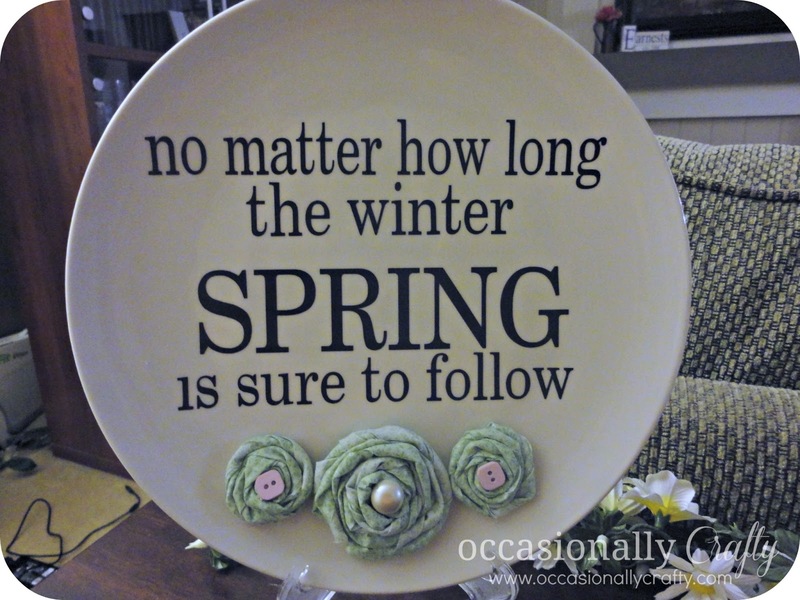 I love the quote on this, especially since it's snowing right now at my house! :) I wanted to let you know I am featuring you in my Point of View post tomorrow! feel free to stop by and grab a button!